I don’t have a traditional spice rack, and come to think of it, I don’t even have a particularly organized way of managing my spices. Most of them sit on top of the microwave in various caper and bullion jars that have been emptied over time. The major players like cumin, nutritional yeast, soy sauce, dill, and Italian herbs sit on top of a little ledge above my oven; the ones who come out only every so often, like allspice and Chinese five spice, are in a different cupboard, with my backstock teas and big empty jars. Which is why the Hanukkah present I got from my dad and his girlfriend a few months ago was one of the most useful gifts I’ve ever received. 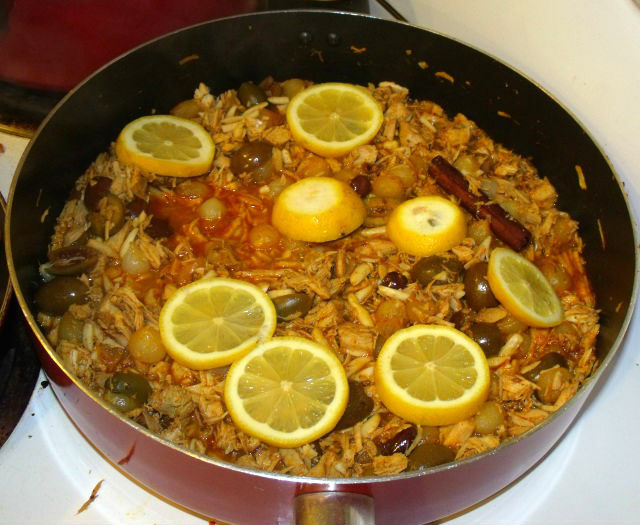 They pretty much had a heyday at Penzeys, and my meals are now all the more flavorful for it. I’ve always been about using fresh bulk spices, never the ones that sit in plastic containers on the grocery store shelves for years. I usually fill little baggies at the New Seasons bulk area and bring them home and put them in cute little mismatched jars, or even order online at The Spice House for the harder-to-find stuff like nigella and saffron. A whole box devoted to curry! 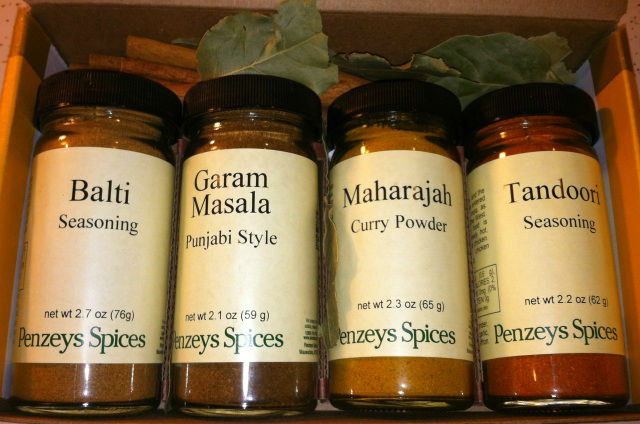 I actually rarely use powders to make actual curries — for that, I’ll usually go with some good paste and coconut milk. 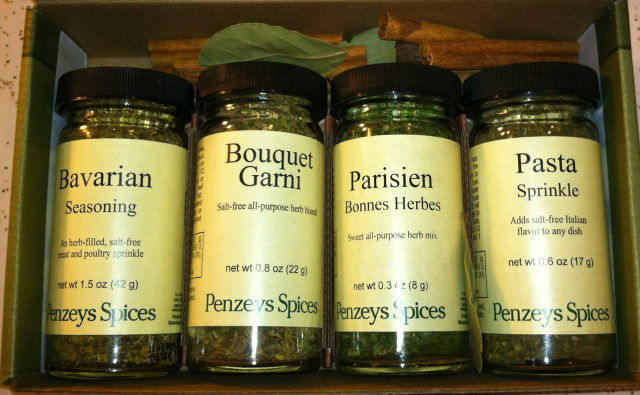 But, I do love to sprinkle any of these on roasting veggies, on a lentil salad, or in dressings. 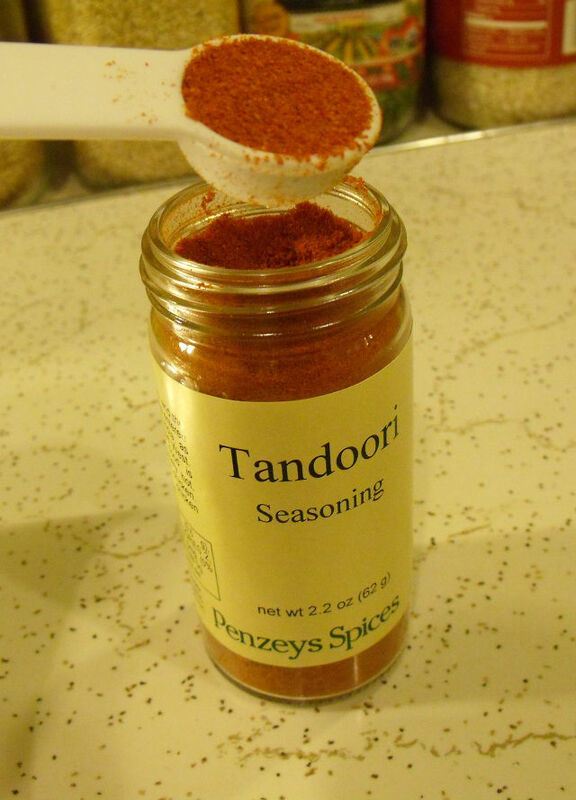 I also love using a teaspoon of the Tandoori seasoning in my rice while it’s cooking. 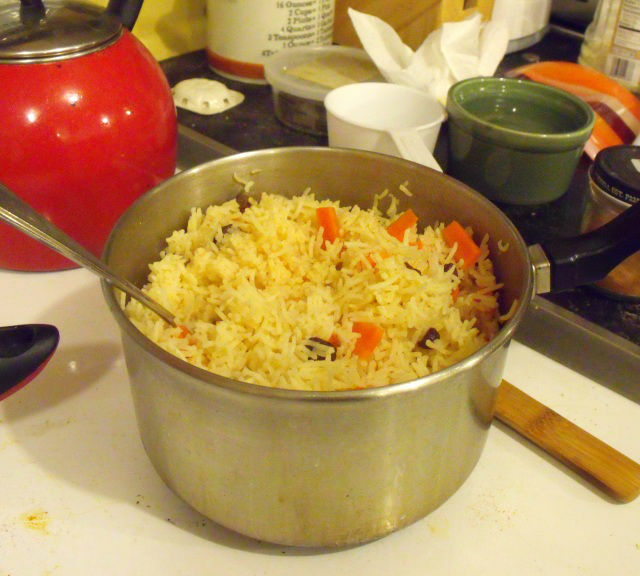 It has just enough saffron to make the entire pot taste like it, but without having to use up my valuable saffron threads! The green herbs. These are great in just about anything, and they’re right when they say the Pasta Sprinkle is really all you need with some yummy pasta, a good olive oil, and some salt or Parmesan. In fact, one of my favorite quickie lunches on my day off is to cook a cup of macaroni elbows, and toss it in a bowl with some homemade cultured creme fraiche (I make this every few months and it keeps in the fridge seemingly indefinitely, always ready to be used as a creamy, tangy butter substitute), salt, pepper, nutritional yeast, some TJ’s red pepper spread, and the Pasta Sprinkle. It takes about seven minutes and is the best faux mac’n’cheese you’ll ever eat. I’m totally in love with having high quality powdered ginger on hand. I do try to keep fresh ginger in the fridge all the time too, but sometimes it’s just so much work. 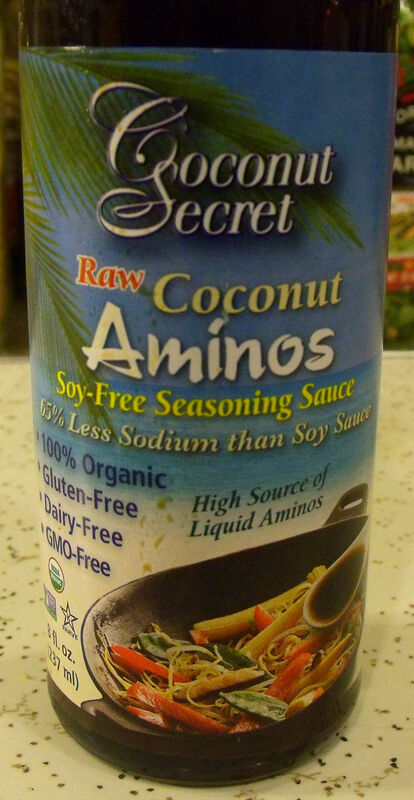 To be able to add a pinch or two of this to an Asian salad dressing or stir-fry is luxurious. 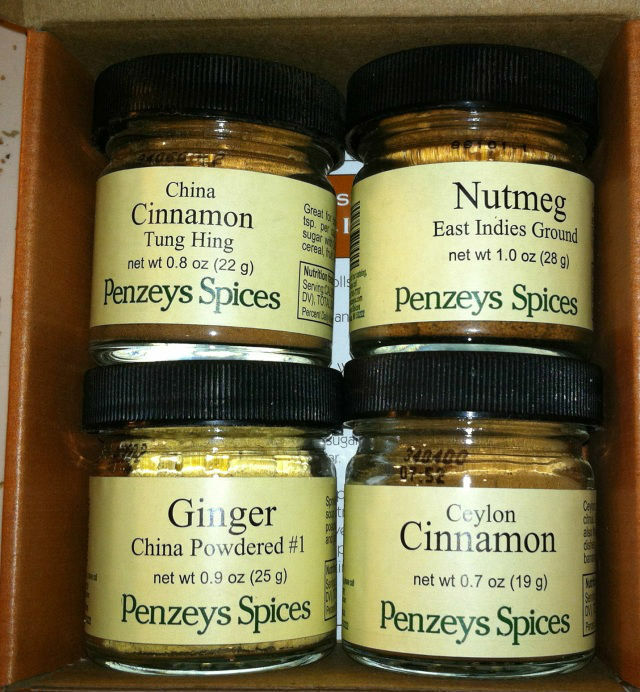 I haven’t gotten to try the nutmeg yet, because these boxes all came nestled in beds of bay leaves, cinnamon sticks, and whole nutmeg, so I’ve been using the latter ground fresh whenever I need it. But, this box is just screaming out for me to make some sort of delicious coffee cake, I know it. The title on this box was “Pepper Lover’s Assortment,” and that couldn’t be more right on. I put pepper on everything, and now for the first time ever, I own a super snazzy pepper mill (that I’ve already had to refill twice, if that gives you any indication) instead of the grocery store one I’ve been using and refilling for five years. Damn, it makes a big difference. This pepper lover just got seriously upgraded. And finally, I think it’s time to take up baking. 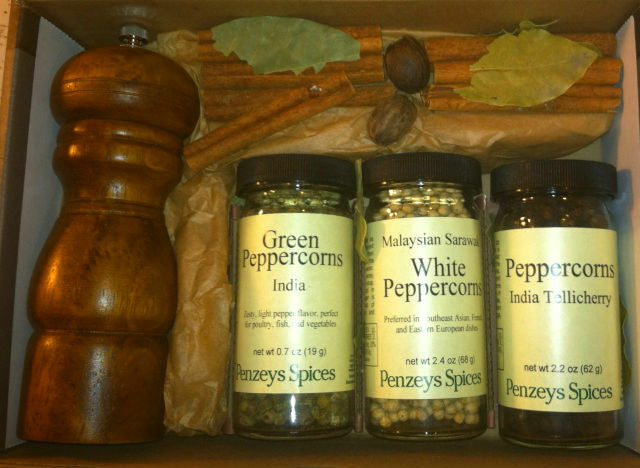 So, needless to say, I haven’t had to spend any money on spices yet this year! There’s certainly enough here to last me for awhile, so this was a nice little bonus to kick off my grocery budget. What are you favorite spices to experiment with? What are your go-tos? 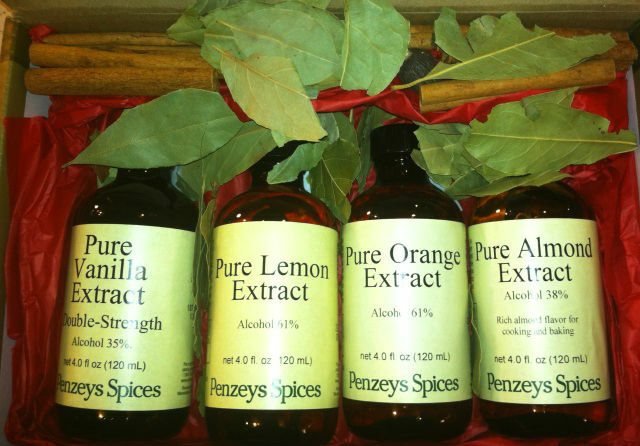 Do you have a good spice store in your neighborhood that you love? Sorry, guys, not too much to report this week. Though it’s been a cooking-heavy week full of delicious, non-inflammatory food as the Great Cleanse of 2012 continues, not much of it was photographed, as my main focus is on some technical behind-the-scenes stuff right now as I transfer this blog over to WordPress and move everything over to our own domain. 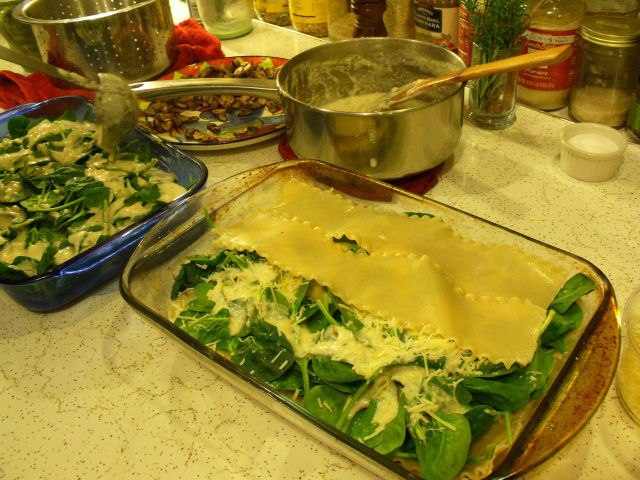 Back on track next week, I promise, when I’ll be cooking up a big mushroom lasagna for a weekend down in Bend to see Yonder Mountain String Band with a house full of friends. In the meantime, I will take you on another gluten-free cracker adventure, this one bearing a surprisingly happy ending. I recently gave in and admitted that no, in fact, I just can’t handle the woodsiness of amaranth hot cereal while I’m in this gluten-free phase of things. I would opt for a fresh fruit smoothie, or the gluten-free granola from New Seasons with almond milk, any day. 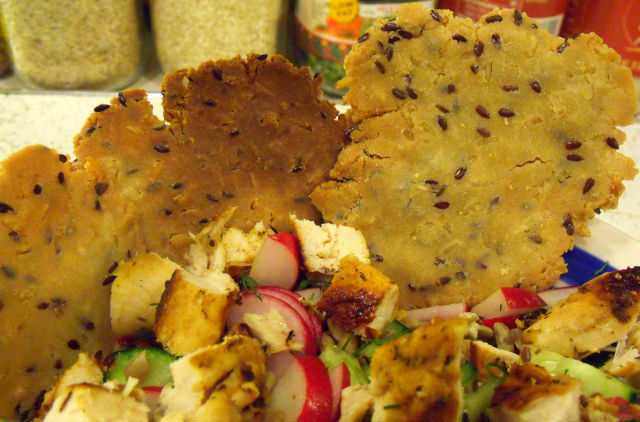 So, faced with a glut of leftover amaranth grains, I decided to try out another go at gluten-free crackers. To start with, I sprouted the amaranth for three days by soaking it in water, draining it in a jar with a mesh top, and then rinsing it daily so the grains stayed moist. 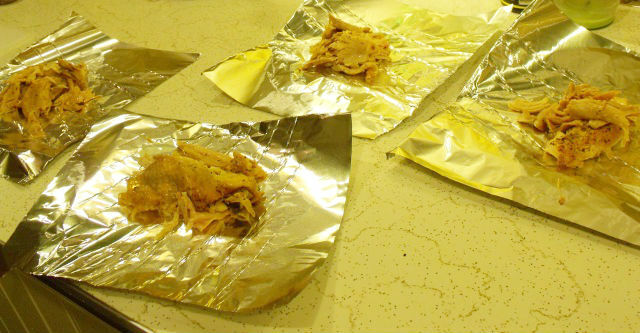 And baked it at 200 degrees for about an hour and a half, checking it every 20 minutes and taking it out right when the thickest pieces were no longer pliable. Theo chocolate bar: $3.59 — no soy lecithin or dairy! Too good to be true! A new look for the blog, next week! Well guys, it’s that time of the year again — the annual Cleanse. No, don’t get me wrong, this isn’t one of those 10-day master cleanses comprised of lemon tea and cayenne pepper. In fact, my cleanse doesn’t even come close to being a fast, of any sort. It’s an anti-inflammatory diet that I do every year around springtime for a few weeks, and it feels awesome. I have a handful of random little maladies that flare up throughout the course of the year — nothing that on its own feels like anything that serious, but right around April is when they all start to converge at once, and start to make me feel a little debilitated. These maladies cover the range of all my systems, from skin to circulation to energy to digestion, and I’d venture to guess that they’re all somewhat connected, and most likely linked to something I’m eating that maybe I shouldn’t be. So far I’ve been lucky, and by doing these elimination diets and then “challenging” my body as I add the forbidden foods back in, I haven’t found any glaring red flags that would urge me to, say, swear off gluten for the rest of my life. For the past few years I’ve been able to use this cleanse as a reset button of sorts, like a spring detox to clear all the lurking toxins out of my body that I probably do have at least some mild sensitivities to, and that pretty much keeps me going for the rest of the year, able to eat and drink whatever I want. Sounds like just about everything, doesn’t it? Well, if you’re accustomed to eating out a lot or relying on processed foods, then yes, it’s pretty limiting. But in fact, cooking at home with simple, fresh ingredients, there are still a bajillion things I can eat. And since I tend to lay pretty low these few weeks that I do my cleanse, not going out to eat or drink, cooking all my meals at home, I like to really get into it. Clearly, I love the challenge of food constraints. This just raises the bar a little higher. What fantastic meals can I make within these limitations? Well believe you me, I have some ideas up my sleeve. In fact, here’s my meal plan brainstorm from last year, and now that I’m going on year three, I have even more ideas to throw in the mix. So on Monday I went to New Seasons and Trader Joe’s and stocked up — lots of fruit and veggies, nuts, dried fruit, gluten-free grains and flours, herbs, chicken and fish, juice, and my favorite: brown rice pasta. Here’s the thing, though. The one thing I crave and go kind of crazy without (aside from, of course, the coffee. Let’s not even talk about that right now. I’m relying on loads of green tea so I can still get up in the morning and run my businesses, but truly, it is no substitute) is crunchy, salty, bready snacks. Rice cakes just don’t cut it for me, and while I have wild aspirations to make rice-and-teff flour enjeras to hold lunch roll-ups, and while I do love me a good dragon bowl full of quinoa and seaweed and roasted veggies, I just really miss the crunchy snacks. Sure, there are rice snacks in the gluten-free aisle, but almost all of them have either corn or soy in their ingredients (if only because they are all tamari-flavored), and the rare few that don’t are crazy expensive. And while, yes, I do bump up my grocery budget a little during my cleanse month since I won’t be going out to eat or drink at all, I just can’t swallow paying $4 for three little rows of round rice snaps. And I figured, if they exist…there’s got to be a way to make them right? Verdict: I’m stoked. I need to work on the texture a little bit, maybe rolling them out with a pin next time, so they’re a little thinner (these definitely could be used as teething rings, which perhaps is why I found the inspiring recipe on a mommy blog), but this pretty much made my week. This yielded about 20 huge crackers, and I’ve been eating them with everything — dipped in hummus for an afternoon snack, covered in mashed avocado and sea salt for a savory breakfast, as the bookends to a faux PB&J sandwich, and as a crunchy accompaniment to my uber-salad for dinner last night. 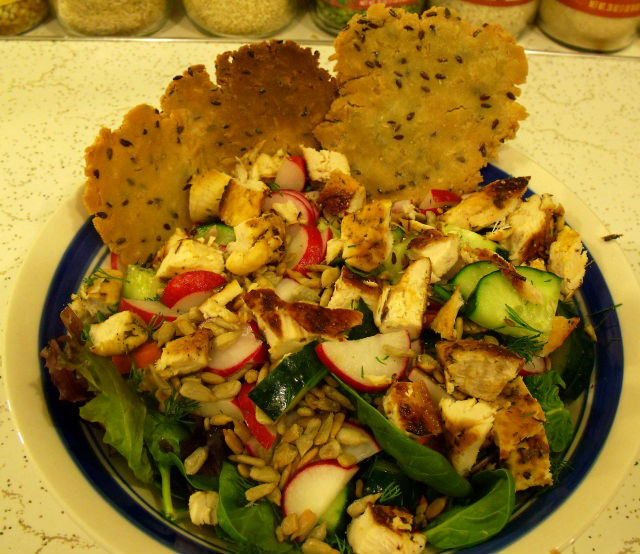 mixed greens, fresh spinach, chopped carrot, radish, and cucumber, sunflower seeds, fresh dill, and browned chicken breast topped with a sweet balsamic fennel dressing. Oh, and I think I may have discovered the solution to the other massive roadblock I encounter every year on this cleanse: no soy sauce. 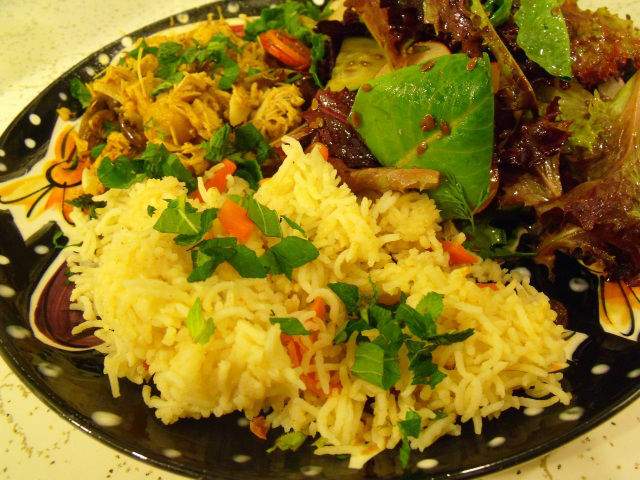 Asian cuisine is definitely the route to go for these few weeks, since so much of the dishes naturally omit the foods I’m avoiding, but there’s just no way to get around soy sauce, providing that certain kind of tangy saltiness that nothing else can! Like I said, I do give myself a bit of leeway this month, since I have to stock up on some ingredients to make this cleanse work that are more expensive than I usually spring for — lots of nuts and dried fruit, exotic flours, fresh fish and chicken. I usually set aside some cash for going out during the month — $20 each week for food, and $15 for drinks, so I’m giving myself an extra $70 in cash to spend on groceries this month if I need to. I also give myself some wiggle room on the local produce rule. Breakfast smoothies necessitate bananas, and I usually need a little more avocado than usual just to stay sane, even if they are coming from Ecuador. 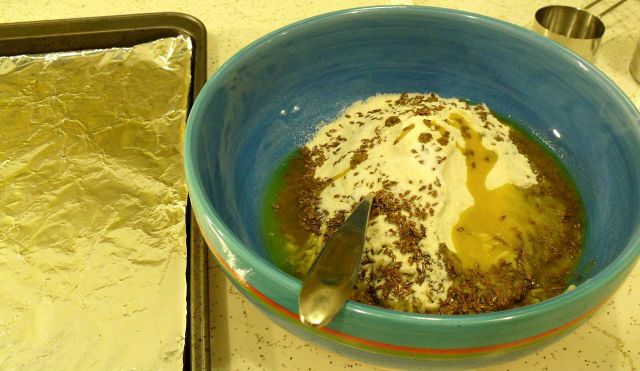 dried hummus mix: $1.68 — add water and olive oil. The perfect emergency snack to keep at work! 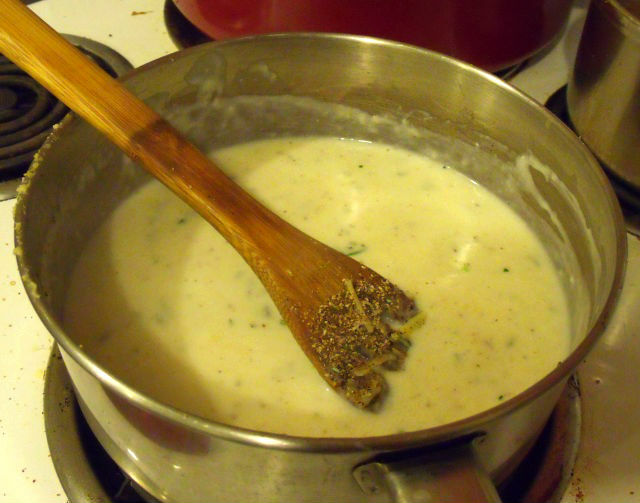 cashews: $6.99 — cashew cream sauce coming up!